You may know Canon primarily for its DSLR cameras. But that is about to change. The Canon EOS R is part of a completely new system that brings the best of EOS DSLR to the mirrorless format. Canon’s new RF mount opens up a whole new world of lens design possibilities. It’s a revolution. 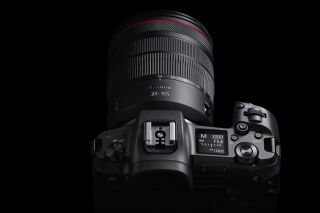 The 12-pin connection allows more advanced communication and power transfer between body and lens, and the 20mm flange back distance lets Canon’s designers push the optical envelope further with their new RF lenses. And with a Canon EOS R camera, you’re not restricted to RF lenses either. The Mount Adapter EF-EOS R lets you use the massive catalogue of existing EF and EF-S lenses, made for Canon’s APS-C and full-frame cameras. There are also versions of the adapter with a filter mount or control ring, for enhanced creative control. The Canon EOS R is the purist’s mirrorless camera. It offers all the progress made in the RF mount, and improved performance in the key areas of camera technology: autofocus, low-light performance and lens quality. Let’s take a closer look to find out how. DSLRs are traditionally renowned for their fast and accurate focusing. This is because they use phase detection, where the light “signal” from either side of the lens is compared to judge whether the picture is in focus or not. Each focal point your select in one of these SLR cameras corresponds to a sensor point on the AF module inside the camera. However, in an amazing feat of miniaturisation, the Canon EOS R has phase detection built into its sensor array. The sensor pixels are split into two photodiodes, which lets them judge focus using the same techniques as a DSLR AF module, without discrete hardware. The 5655 AF positions cover 100 per cent of the scene’s vertical, and 88 per cent of the horizontal, for class-leading AF flexibility. © Brent Stirton Canon ambassador and photographer Brent Stirton uses the EOS R for shooting in remote parts of the world. The Canon EOS R has a truly next-generation AF system, and it can lock onto subjects at up to -6 EV. In real terms this means it will focus in near-pitch black conditions. Its full-frame sensor is just as important. Despite having a resolution of 30.3 megapixels, this large sensor area means the sensor pixels are over five microns in size. This provides superb native sensitivity, for much better image quality and shooting flexibility in low light. You can see the power of the Canon EOS R autofocus and full-frame sensor in action in the work of Canon Ambassador Clive Booth. He shot promotional images for the ballet Fire and Fury using the EOS R. Its low light capabilities let him shoot a dancer shrouded in fabric blown into the shape of a flame, and use fast enough shutter speeds to freeze that shape in the frame without introducing noise. A less capable camera simply wouldn’t be able to create such professional-looking results. The Canon EOS R is part of a brand new system with its very own RF lenses. The versatile RF 24-105mm f/4L IS USM is the camera’s “kit” lens. And there are already three other lenses on offer: the perfect-for-portraits RF 50mm f/1.2L USM, the jaw-dropping optics of the RF 28-70mm f/2L USM, and a RF 35mm f/1.8 IS Macro STM for powerful close-up images. These give you quite the fulfilling package, and with Canon plans to release many more lenses, this is only the beginning for EOS R and the RF lens family. For more on the camera, check out the Canon website.